I don’t usually write blog posts that are about someone else’s book. BUT–Lynn Zubernis asked for my ‘thinky thoughts’ about her new book, Family Don’t End With Blood, so here I go. The story so far….Lynn runs the Fangasm Supernatural fan site and is @FangasmSPN on Twitter. She’s very active at SPN conventions and both she and Laurena Aker of the WinchesterFamilyBusiness site are pillars of the Supernatural fandom community. 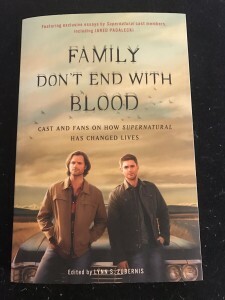 Family Don’t End With Blood is Lynn’s new book about how Supernatural–the show, the characters, the actors and the fandom–changed lives and helped people through depression, anxiety, self-harm, suicidal thoughts, grief, physical challenges, self-harm and other issues. It includes interviews with actors, fans and others who are part of the SPNFamily. I knew I was in trouble when I choked up on the introduction. Trust me when I say I’m not a big crier. I was teary before I was even into the first essay. Not sad tears, but that sense you get when you come home and know it. I’ve talked candidly about how fandom saved my life when I was 15. And I’ve also talked about why, in these frightening and unstable times, we fans need each other and our fandoms more than ever. And I’ve also shared how Jared Padalecki and Jensen Ackles’ #AlwaysKeepFighting (#AKF) campaign via the Supernatural fandom inspired me to pull together 100 science fiction/fantasy authors for the #HoldOnToTheLight campaign. Fandom has been part of my life since I was about 15. Now that I’m an author of epic fantasy, urban fantasy and steampunk, I’m not only a fan, but I’m up on the stage on panels, talking about how we create the worlds readers escape into, as well as other fannish interests. Most of my friends are involved in fandom at some level or another, either as pros or fans–or both. I travel for about 15 sci-fi/fantasy conventions a year all over the U.S. and sometimes Canada. I am writing eight novels this year, plus some short stories and novellas. I spend most of my waking hours surrounded by the characters in my books. So I take fandom very seriously. 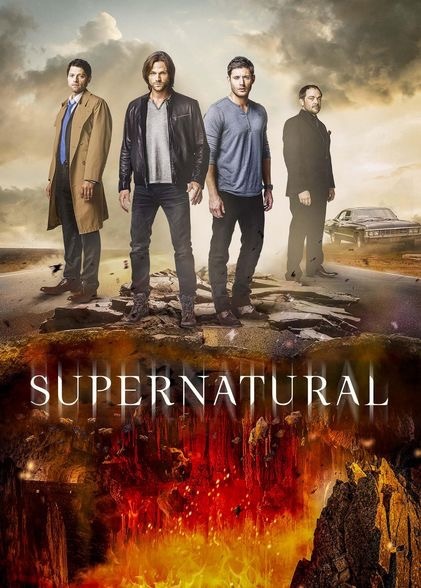 I came late to the party on Supernatural, diving into the show during late S11 and got completely caught up on all eleven seasons plus all the tie-in books (and reading more fan fiction than I will admit to sober) by the start of Season 12. I haven’t gone this deep into a fandom since the first Star Wars movie came out in 1977. And gradually, I came to understand why. I knew about Supernatural because one of my daughters had watched it when the show first came out and she said I would like it. Then last April, all of a sudden it seemed like the right time to start in. I was hooked from the start, and we binge watched a couple of episodes each night. Little did I know that I was also just heading into a storm of personal upsets and set backs that still hasn’t fully worked its way out. I found myself getting immersed in the show–and then the books and the fan fiction–as a way to hang on. One of the first ways Supernatural changed me happened when I saw how much good came out of the #AlwaysKeepFighting campaign. I was really impressed that Jared and Jensen and Misha would use their platform to do something so personal and important. That got me thinking. Writers aren’t famous like actors, but our books create the worlds that inspire TV shows and movies–we create the genre. I know a lot of writers, and I also knew that we all had our own demons. So I asked 100 of my author friends if they would be willing to write a post on their own blogs about how mental health issues like depression, suicide, PTSD, anxiety, self-harm, etc. had affected them, someone they loved, their characters and their writing. I called it #HoldOnToTheLight, and the goal was to decrease the stigma about mental health issues within fandom, to stand in solidarity with fans, and to encourage readers to seek help. You can find more about #HoldOnToTheLight and the master post of blogs at www.HoldOnToTheLight.com. We also encouraged convention runners to add panels on mental health to con programming or to expand/promote panels they already offered. The list of cons with those panels is growing, and now includes GenCon (approx. 70K attendees) and Dragon*Con (approx 80K attendees). But Supernatural wouldn’t let me go–and going through a personal rough patch, I dove in deeper. I found my way into online fandom, first by immersing myself in fan fiction, fan videos and art, and then gradually getting involved in the lively, ongoing conversation on Twitter. That’s how I met Nightsky, and as we chatted–first with tweets, then direct messages, then emails–she asked me to do a guest blog post for Winchester Family Business based on some comments I’d made. Then I was heading to Chicago to a non-SPN convention, and we agreed to meet up between my panels. We ended up spending most of the day together and having a wonderful dinner, and then continuing the conversation via email afterwards. I’ve written another guest blog since then for WFB and might do so again. Along the way, I started to live tweet the new episodes, and met even more fans. Now going out on Twitter is a highlight and social point of my day, responding to conversations, posting photos and memes, and enjoying the SPNFamily’s online companionship. I’m still not through that rough patch, but the SPNFamily is helping me hang on–they mean more to me than I can express, and I hope I can pay the favor forward. There’s one more reason Supernatural is so special to me, and I didn’t realize it until I was well into season six. Sam and Dean faced down the specter that dominated my childhood and convinced me that I would never live long enough to become an adult: the Apocalypse. 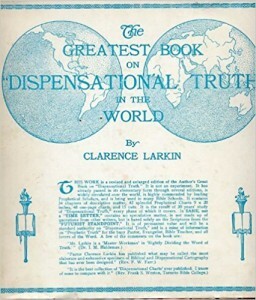 One of my favorite books as a child and pre-teen was Clarence Larkin’s The Greatest Book of Dispensational Truth. 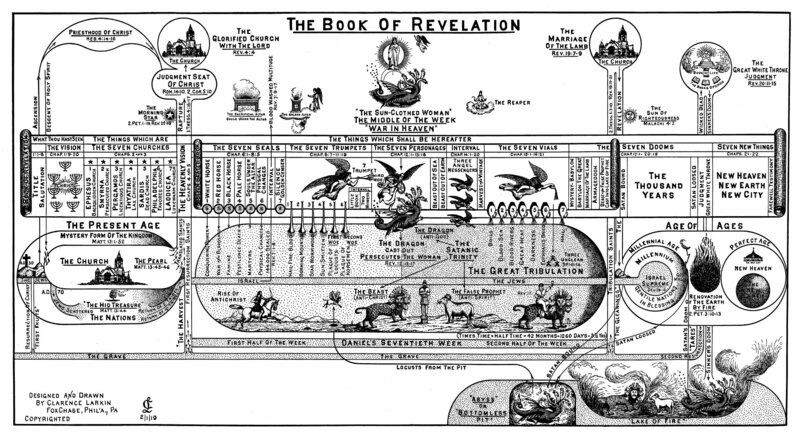 It was–I kid you not–an illustrated, fold-out guide to the Apocalypse that did not consider itself to be fiction. If you wonder where Supernatural got its horsemen, Leviathans, the Witnesses, the Seals, the Whore of Babylon, the Beast, the AntiChrist and so much more–it’s all in there, in pictures. Larkin and John Nelson Darby popularized the Rapture and Armageddon mythos by reading several prophetic books of the Bible (Ezekiel, Daniel and Revelation as well as the apocryphal book of Enoch–yes, it’s where Enochian comes from) and interpreting them outside of generally accepted methods of textual criticism and archeological/cultural study. In other words, they in a sense wrote fan fiction of the Bible, and it stuck. When these frightening images are part of what all the adults around you accept as real and inevitable, it is terrifying to a child–like finding out that the monster under the bed is real. It was too big to handle, and the only advice from adults was just to make sure my soul was ok when it came my time to die. At the same time, my parents got pulled into a secretive network of conspiracy theorists who believed that Communists had infiltrated the world governments at every level and that–any day now–we were all either going to die or be imprisoned in gulags. One of my earliest memories is my mom coaching me on how to behave when the day came that we would be taken to a prison camp. I think I was around four or five. My uncle got us into it. He had been in infantry and then tanks in World War II and saw combat in the Battle of the Bulge. I believe he returned with severe PTSD, which went untreated and unacknowledged, and I think it made him vulnerable to the nightmarish scenarios of the conspiracies. My uncle’s friends were also WWII vets. They passed information via short-wave radio (no internet back in the 1970s), through secret get-togethers, and by word of mouth–always wary that ‘They’ were watching. So I grew up with people who stockpiled ammo and hid guns in the walls of their houses, who had bunkers and safe houses, who talked about keeping a stash of silver coins on hand so that when–not if–the banks collapsed and currency lost its value, we could run and go to ground. I grew up with caches of freeze-dried food–enough to last five years–and survivalist tactics and friends who trained their kids to strip a gun blindfolded. My uncle and his friends saw themselves as the thin gray line of sentries in a war against evil, willing to die for a cause kept secret because others would think it was crazy. I don’t think John Winchester and Bobby Singer would have shared the political views of my uncle and his friends, but they could have walked into the room and had a drink with them and understood those guys. They were damaged men, trying to do the best they could, protecting the people they loved. Shedding those two pervasive world views that had shaped my understanding of reality nearly destroyed me as a teenager in my college years. Fandom and my early attempts at writing the novel which would someday become The Summoner kept me alive. Back then, I discovered I could entertain and amuse my friends by writing fan fiction for Star Wars, Star Trek, Space: 1999 and other shows. We passed the typed or hand-written stories around at convention room parties in the early 1980s. For a short time, I even ran a fanzine. I belonged in fandom the way I didn’t ever belong in my birth family, at my church, at my college or with most of the people I knew growing up. Inside fandom, I was safe. Inside fandom, people understood and liked the same things I did, they got the jokes and the catchphrases. They validated, affirmed and encouraged. We might have been freaks to the outside world, but we were freaks together. When I started watching Supernatural, I didn’t realize the connection at first. Then one day, it hit me and I was poleaxed. Sam and Dean faced down my personal bogeyman–the Apocalypse–and survived. Scarred, yes, but still standing and stronger than before. True heroes. So when I read Lynn’s awesome book and the essays by creators, actors and fans alike about the strength and healing of the fandom family, I totally understand. I cherish my time at conventions when I can be with my tribe–although the events at which I’m a panelist are general sci-fi/fantasy cons instead of the SPN cons (which do sound like a lot of fun). I’m so thrilled that because of Supernatural, a much larger group of people have come into fandom and found that refuge. We all find our corner of fandom, whether it’s books, movies, TV shows, cosplay, gaming, LARP, comics, filk music, art or a mix of all of those. One of the most affirming thing you can hear as an author is that your book and characters got someone through a hard time. I have read books by favorite authors that got me through depression, loneliness, deaths in the family, and stressful circumstances. And my most cherished notes from readers are the ones who tell me that my books kept them company at the bedside of a dying loved one, got them through two tours of duty in Afghanistan, or otherwise helped them survive hard times. As Lynn shares in her book, that two-way support is taken to a whole new level of special with the Supernatural fandom and its creators and actors. I’ve seen that kind of support in action, and I know how powerful it can be, and how wonderful it is to belong to a community that welcomes you and encourages you to be your real self. I’ve felt that welcome myself as a newcomer to SPNFamily–take a look at my Twitter feed, It’s turned Twitter into one of my favorite activities. I look forward to seeing what new wonderful comments and photos my SPNFamily is going to share that day, and enjoy trying to return the favor. Getting adopted by this wonderful group of people has meant a lot to me. So go buy Lynn’s book. Give it to a friend who needs encouragement. But even more importantly, continue being the wonderful fandom and SPNFamily you already are and be there for each other. Because family really doesn’t end with blood–in the end, our true families are the people we choose. I mostly write about necromancers who are good guys. Tris Drayke, the main character in my Chronicles of the Necromancer/Fallen Kings Cycle series, struggles to control his power as he rises to be the strongest Summoner of his generation. Tormod Solveig, a secondary character in my Ascendant Kingdoms series, wields his power as a warlord and a necromancer with his sister Rinka, a fearsome warrior, watching his back. Archibald Donnelly, in my Deadly Curiosities dark urban fantasy series, takes the low key approach to necromancy with the misleading demeanor of a laid back archivist. They’re the good guys, wrestling with the temptations of fearsome power to remain on the side of light. Now let’s go dark side. In the steampunk world of Iron & Blood, which I co-write with my husband, Larry N. Martin, we meet the dark necromancers, the Resurrectionists, Francis Tumblety and Adolph Brunrichter, as well as the Dollmaker, who try to uncover the secrets of clockwork-driven immortality. Scaith, a dark necromancer, also appears in The Sworn and The Dread in my Chronicles/Fallen Kings series, and the devotees of the dark goddess Shanthadura also move into the territory of dark necromancy. In Vendetta, part of my Deadly Curiosities series, Sariel calls on dark magic to control reapers and nephilim who in turn feed on the spirits of the dead. And in The Shadowed Path, we meet Foor Arontala, a blood mage. He is not an necromancer himself, but he is sworn to freeing the soul of the Obsidian King, a powerful dark necromancer whose soul was imprisoned after he nearly brought the Winter Kingdoms to destruction. I’ve written about hero necromancers because I don’t believe power is intrinsically good or evil; what matters is what you do with the power. And as Spiderman knows, with great power comes great responsibility. What makes the responsible use of great power very difficult is imperfect information and human nature. Without complete information, it’s easy to draw incorrect conclusions, come to bad decisions, and believe you’re using the power to do the right thing when in fact, you’ve been badly misled. Worse, dire circumstances can tempt the best people to wonder if in this particular case, the end justifies the means. And of course, ego, denial, fear, anger, and the need for vengeance can blind us and send us down the road to hell with plenty of good intentions. Which means that to remain serving the Light, a necromancer must be as vigilant about his/her actions as about the threats from the enemy. More so, perhaps, because self-delusion is easy and comfortable and the consequences of wrong choices affect both the living and the dead. So the distinction that I draw between good and evil when it comes to necromancy comes down to respect for free will and volition. A necromancer who serves the Light will not force an unwilling spirit into a dead body, nor trap a spirit in a corpse that wants to be free. He or she will not keep a spirit from crossing to its final rest, nor trouble the spirits of the dead for personal gain or selfish reasons. A good necromancer might call summon the spirits of the dead to learn information that benefits the larger whole. In battle, he/she might make it possible for the willing spirits of dead soldiers to reanimate their corpses or give their ghosts form and substance to fight. It is permitted to bind a spirit that wants to be healed to its dying body long enough for the body to be healed. A Light necromancer would be duty-bound to release spirits held against their will by curses or Dark magic. So what about Dark necromancy? That gets into ‘evil legions of the undead’ territory. Dark necromancers are willing to use the souls of the dead and their ravaged corpses as shock troops, or to bind the souls of tortured and broken prisoners to their dying bodies and send them first into battle as sword fodder. The darker side of necromancy traps spirits and forces them into servitude, either as revenants or as zombies. Dark necromancy acts for selfish purposes and the aggrandizement of power without regard for agency, free will or self-determination. Dark necromancy considers the spirits of the dead to be tools, nothing more than means to an end, without respect for them as human beings or immortal souls. A dark necromancer may serve a god or goddess and/or owe a deity a debt for assistance, but the practice of dark necromancy essentially sets the mage outside of and above humanity by meddling with human souls. Dark necromancy, in my worlds, is tied to blood magic, which requires forbidden magic and usually either human or animal sacrifice. Once again, intention is key, since the willingness to sacrifice another living being for the accumulation of power marks and sullies the soul of the practitioner. In the end, the same choices that make a dark necromancer also make a monstrous human being: the disregard for freedom of choice and the value of human life. If you ever find yourself in one of my fictional worlds, that’s good advice. Personally, I blame my fascination with cursed and haunted objects on a childhood spent being dragged around to antique shows, flea markets, swap meets and used book stores. While my dad explored the cast-off treasures, I passed the time making up stories to amuse myself about the oddities and old items set out on display. My imagination had plenty of fodder looking at old books in crumbling leather bindings, vintage clothing, antique personal items, even huge, working steam engines. Our house was littered with dad’s finds, from halberd axes and old-time bear traps under the eaves in the attic to big steam-driven engines from saw mills and factories that filled up our yard. It’s never been difficult for me to imagine the people who owned the items, to picture their lives and the circumstances that led them to buy the object or discard it. It’s no real wonder that cursed and haunted objects turn up frequently in all of my book series. In my Deadly Curiosities dark urban fantasy series, my main character Cassidy Kincaide is a psychometric who can read the history and emotional resonance of objects by touching them. I don’t claim that kind of ability, but I’ve always been able to imagine what it would be like to know something about an object’s ‘experiences’ and previous owners on contact. And on a darker note, to feel their pain, their loss, their madness and the turbulence of their lives by touching objects that accompanied them on their journey. In my epic fantasy, I’ve used haunted swords, magical amulets and jewelry, crowns that convey kingship via magic as well as symbolism. Even in the Iron & Blood Steampunk series that I co-write with my husband, everyday objects like dolls, necklaces and other items become supernaturally dangerous either because of intentional spell work, intrinsic evil, or because they have ‘soaked up’ the disquieting experiences of their previous owners. As I’ve browsed antique stores and yard sales over the years, I can think of instances when I instinctually gravitated toward some unremarkable items, and shied away from others. Perhaps it was just my imagination, but there have been pieces that I wouldn’t touch on a bet, that I did not want to make a connection with. When I browsed through a shop in New Hope/Lambertville that specialized in Victorian memento mori hair jewelry and death photography, I kept my hands clasped in front of me. When we worked through my father’s collections after he died, there were a number of items that gave me or my husband ‘the creeps’–seriously bad vibes. A psychic family friend singled out a few objects of dad’s collection he had no way to know even existed and advised us to remove them from the house because of their negative mojo. I can’t prove there was anything substantial to those warnings or my feelings, but I felt better being rid of the items, and I’ve learned to trust my gut. The idea that the objects that we keep close to us throughout our lives, things we wear next to our skin and over our hearts, items that accompany through the poignant moments in our personal history might soak up some of our emotions doesn’t seem that far-fetched. It’s certainly a concept many other people have had throughout history, and the thought behind the lore of religious relics, sacred objects and protective amulets. Many–if not most–of the objects in my Deadly Curiosities series are based on pieces I inherited–and got rid of–from my dad’s collection. I’ve been up close and personal with the items. That made them a natural to work into my fiction. So the next time you wander into an out of the way curio store or eye the offerings on a table at a flea market, pause before you reach out to pick up that tempting treasure. You might find that it comes with a dark–and unwelcome–supernatural something extra. With six different book series in various stages, it seems like I’m always contemplating beginnings, endings and extensions. I’ve got a new epic fantasy series coming out in 2017 from Solaris Books (which I’m not allowed to name or reveal details about), so beginning a new book and starting a brand-new series have both been on my mind as I finish up that manuscript. In March, Shadow and Flame marked the final novel in my Ascendant Kingdoms epic fantasy series (Orbit Books), so wrapping up not just a single book but a story arc and a series is also fresh in my thoughts. The Shadowed Path (Solaris Books) is a collection of eleven of my Jonmarc Vahanian Adventures short stories that are prequels to The Summoner and my Chronicles of the Necromancer series, which has wrapped up (for now). With a little time until the next Iron & Blood Steampunk novel or the next Deadly Curiosities dark urban fantasy novel comes out, the short stories and novellas tied into those series help to bridge the gap for readers with an extended universe of additional adventures. That sixth series? It’s a space series that’s currently in development, with some hints dropped in the Origins Gaming Fair anthologies, so we’re beginning both another book and another series. Beginning a series is exciting and a little terrifying. Before I can sit down to write, I’ve got to do a lot of mental world-building to create the setting for the books, flesh out the characters, plan the series story arc, and develop the history, legend, belief/magic systems and lore of the world so that the reader gets a multifaceted, immersive experience. I want to make sure I’ve thought everything through, because once I’ve written the first book, canon is set and I don’t want to paint myself into a corner with limitations I’ll regret later. Most importantly, I want to make every series the best books I’ve ever written to make them fun and memorable for readers. And of course, I want the books to do well in the marketplace, which makes both me and the publisher happy. No pressure. Whether a new book is the first in a series or somewhere else in the sequence, each one begins with a blank computer screen. No matter how many times I do that, it’s always a little intimidating, and there’s a thrill of fear that crawls through my veins at the thought of transforming six hundred blank pieces of paper into a book. I can be armed with a thorough outline and lots of great ideas, I can be antsy to put ideas down in words, and I might even be mid-series with well-established characters and a world I know well. It’s still scary and exciting, because while I’m taking my characters on a new adventure, I’m embarking on an unknown journey right along with them. I know that, despite my planning, I’ll run into unanticipated obstacles and places where I have to sit back, re-read and re-evaluate in order to get the plot right. And I also know that, out of the blue, inspiration will strike when I least expect it and there will be scenes, characters and action that show up full-blown in my imagination and that is a wonderful thing. Writers live for those moments. Ending a series is as sad for an author as it it is for readers. It’s gratifying to get to the end of an adventure, and there’s a sense of accomplishment to wrapping up an epic journey. But when I’ve kept company with the characters every day for the years required to write a multi-book series, it’s disappointing to think that they won’t be hanging out in my head as often moving forward. Craft-wise, it’s important to make sure all the loose ends and plot bunnies have been handled by the end of a series, so readers aren’t left thinking, ‘whatever happened to…’. I want to be sure to leave readers with a satisfying conclusion that may be bittersweet, but feels authentic and organic. Thanks to electronic publishing, series never have to completely end so long as there are readers interested in continuing adventures. We write short stories and novellas that are extended adventures for all of the series. Some are prequels, like the Jonmarc Vahanian Adventures. Others are extra ‘episodes’, like the Deadly Curiosities Adventures and the Storm and Fury steampunk adventures tied into the Iron & Blood universe. And some fill in a ‘gap’ in the main books that wasn’t part of the main story arc but begs to be told, like the Blaine McFadden Adventures that tie in to the Ascendant Kingdoms books. With extended adventures, I get to dig deeper into my world-building, reveal more about both main characters and secondary characters, and give readers extra stories that are part of canon but go beyond what’s in the novels. The stories stand alone, and obviously don’t have as large or complicated a story arc as the novels, but they flesh out the people, places and world, and help to bridge the time between new books. I’m thrilled that it’s easier than ever for adventures with favorite characters to continue indefinitely. And that’s a win for readers and writers. People are people–how much of a difference does a couple hundred of years make? A lot–and less than you might think. I write epic fantasy and urban fantasy, and co-authored with Larry N. Martin, steampunk. That’s a pretty broad time span, from roughly the late fifteenth century to the Victorian era, to modern day. The protagonists are all human, though some have enhanced abilities and immortality. And while being human doesn’t change over those centuries, other factors that influence how we define our humanity and our place in the universe certainly do. It’s true that people remain much the same in their love, hate, ambition and failures. In every age, human beings fall in love, cherish their family and value friends, suffer betrayal and grief, take risks and make mistakes. Yet our times and our surroundings, as well as our world view, inform and constrain the choices that occur to us to consider, and shape the courses of action we believe are open to us. My two epic fantasy series–The Chronicles of the Necromancer/Fallen Kings Cycle and The Ascendant Kingdoms Saga–take place in worlds other than our own, but with roughly the social structure and technology of late fifteenth century Western Europe. Monarchies and the nobility hold resources and power. Most people remain in or close to the villages where they were born. The lowest classes are bound to the land, and the highest classes owe fealty to a lord. Religion, alchemy and magic define how the cosmos function, and inform one’s view of where one fits in that cosmology. Duty to one’s king or liege lord supersedes individual choices. Existential questions are seen through the lens of dedication to the gods and goddesses, or the teaching of clergy. Most peoples’ destiny is determined by birth and caste order, as well as whether or not they can do magic. Defying convention and culture is possible, but carries heavy social and personal consequences. A great deal of personal identity is determined by group identity: family, kingdom, religion, gender, ethnicity, caste, profession. Individualism as we think of it in modern times is a radical notion which threatens the status quo. Myriad social obligations to one’s family, clan, village, Guild, and kingdom define one’s use of time. In the Iron & Blood Steampunk series, it’s the height of the Victorian age, and human self-confidence is at an all-time high. Science overcomes new obstacles and solves old mysteries every day, and it seems like just a matter of time until the secrets of the universe are laid bare. Technology emerges to meet every challenge, and inventions are proof of limitless creativity. Every day, in every way, the world is getting better and better. And yet, cholera and malaria and typhus and Yellow Fever scourge cities. Life is good for the upper classes, and, well, ‘Dickensian’ for those who aren’t. Infant mortality and childbed fever kill civilians while thousands die in places like Gettysburg and Antietam. Colonialism and racism take a horrendous toll which will not be seen or grasped for another century. Victorians bow under the weight of grief, and spiritualism is on the rise, seeking the answers science can’t provide. Strict social etiquette and suffocating class and gender roles restrict and constrain, and being openly LGBTQ earns prison or worse. People are people, but the Victorian lens through which the self and the world is viewed is narrow and particular. My Deadly Curiosities dark urban fantasy series is set in modern-day Charleston, SC with a secret coalition of mortals and immortals who eliminate supernatural threats and get haunted and cursed objects out of circulation. Cassidy is our modern contemporary, shaped from our current culture, yet her psychometry enables her to sense a whole additional reality as she reads the history of objects by touch, and her knowledge that the supernatural is real informs her choices and world view in a way that sets her apart from those who don’t share her secrets. Sorren, a nearly 600 year-old vampire, knows how to adapt to changing times, yet his reactions and insights are a product of six centuries of enculturation and observation, and he will never again be part of his own time period. When you’ve come face to face with Voudon loas and ancient god-like beings and battled monsters and creatures right out of legend and myth, your existential framework is going to be a little bent. When you know that the things that go bump in the night are real, when you’ve saved the world a couple of times though no one knows it, that changes your reactions to what’s on the news, shifts your perspective about what’s important, and changes your priorities. How are the characters different among the subgenres? For me, they’re a combination of the familiar and the unfamiliar. The aspects that make them human–love, hate, passion, the need for connection and the desire to complete a task, make a difference or right a wrong–make the characters identifiable and relatable. The aspects that are influenced by culture impart believability within the timeframe of the story and make them interesting and memorable, truly a part of their era. For an author, it’s a fun challenge to bring off a mix in a way that forges an emotional connection for the reader. And as a reader, when that mix is done well, it opens a gateway to experience different lives and different times. Epic fantasy is medieval, full of sweeping battles, world-altering conspiracies, and the rise and fall of kingdoms and civilizations, reminiscent of real history and yet altered. Urban fantasy brings the supernatural into something akin to our own world, recognizable and familiar but with key–dangerous–differences. Magic is the most important of those differences and alterations. But while magic is present in both urban and epic fantasy, the magical systems, its invocation and use are often handled differently, and its practitioners treated differently between the two types of fantasy. Those differences are a key part of the world building, and the treatment of magic helps to define both the world and the characters. Think about magic in an epic fantasy setting, and most people picture a wizard like Gandalf–robed, larger than life, with wild hair and a staff, casting lightning bolts and working spells. Part of that draws on the medieval setting. Lots of people wore what we would now call ‘robes’, especially if they held a priestly or expert role–like a wizard, who was scholar, alchemist and mage, perhaps even a conduit for divine power. Magic in epic fantasy is heavily liturgical, couched in elaborate spells and rituals with powerful relics and arcane materials. Grounded in a time when science was alchemy and superstition rivaled rationality, epic fantasy magic feels grand and elaborate. Magic might have been frowned upon by religious authorities, feared by kings, or sought by devotees, but it was not alien to the understanding of how the world functioned, was not antithetical to the foundations of the wide-spread belief systems. Magic in epic fantasy might be rare or common, hidden or openly practiced, but its existence was not unbelievable, nor did the possibility of it seem counterintuitive to the people of the time. For medieval thinkers, it wasn’t a stretch to believe magic was possible; they questioned whether it ran counter to morality and divine decree. Magic in urban fantasy still has aspects of mystery, ritual and lore. After all, magic and the supernatural are all about the boundary with the unknown and the hidden. Yet in urban fantasy, the people wielding the power are our contemporaries, products of the modern world, as much a product of science and culture as the reader and the author. Using magic for a modern practitioner requires being able to set aside contemporary presuppositions about what is and isn’t ‘real’ or possible. It’s less of a religious objection than a scientific one, the sense that it shouldn’t be possible to set aside or alter the laws of physics. Invoking magic in urban fantasy may draw on ritual, relics and lore but those elements are handled through the lens of modern rationality, not superstition. And for the record, magic in a steampunk world draws on the Victorian sensibility that everything was ultimately knowable, and that science could conquer everything–even the supernatural, or at least explain it and reduce it to a knowable system. I write epic fantasy, urban fantasy and steampunk. The magic is different among the genres in important ways, and yet much about the power and its use and costs remains similar. In my Chronicles of the Necromancer/Fallen Kings Cycle epic fantasy series, necromancy and blood magic are two ends of a spectrum separated by the ethics and intentions of the practitioner. The magic of the nomadic Sworn is shamanistic, while the Nargi priests attribute their magic to their dedication to the Crone aspect of the Sacred Lady and are sure all other magic is infernal. Magic is a force of nature that some people can tap into and control. It is known and accepted, but most people do not have any ability, and necromancy is the rarest magic of all. In the Ascendant Kingdoms Saga epic fantasy series, a devastating war destroys two kingdoms and knocks out the artificially-imposed control over magic, leading to massive destruction as wild magic causes deadly storms and opens portals for monsters to come through from other realms. The loss of the ability to control magic in a magic-dependent culture where most people have at least a little talent wrecks havoc on an everyday scale as well. Hero Blaine McFadden must not only gain military control to regain order, but also reimpose the binding on magic to save his people. Switch to my dark urban fantasy series, Deadly Curiosities, and modern-day Charleston, South Carolina is a hot spot for supernatural perils. I draw on a variety of magical traditions including Voodoo, Hoodoo, Native American, old Norse and European magic, with a main character who can read objects by touch and supporting characters with a variety of supernatural abilities. It’s our world, with a twist, and the characters believe in the supernatural because they have seen and experienced its reality. Ritual and lore are often part of focusing concentration and harnessing power, but magic is not superstitious or necessarily an issue of religious faith; it is grounded in its own rules and systems. And then there’s the Steampunk series, Iron & Blood, with the ever-optimistic Victorians who relish exploring the unexplained. Science and magic are at odds as the old ways and the new sensibilities vie for dominance, but beneath it all is Victorian rationality, the belief that the truth is out there. Inventors like Edison create machines to record the voices of the dead, while Nikola Tesla harnesses energy in ways that put wizard lightning to shame. It’s a brave new world, but it straddles both old and new ways of thinking, and the tension between those realities is part of the fun. Same kingdom, different perspective. And what a difference that makes. In The Summoner, the first book of my Chronicles of the Necromancer series, main character Tris Drayke survives assassins sent by his half-brother, Jared, who has implemented a palace coup, killing all of the rest of the royal family except Tris. When Tris and three friends escape, Tris discovers quickly that as the youngest son of the king, he knows little of practical value and even less about survival outside his sheltered existence. Since Tris is the focus of the Chronicles books, much of that story is seen through his eyes as he gains a whole new appreciation for the reality of the lives of the common people of Margolan, and experiences first-hand the Usurper’s iron-fisted rule. The lessons are humbling and hard, but they make him the king he will eventually become. Jonmarc Vahanian is both bodyguard and unwilling mentor, becoming a loyal friend and unintentional king-maker. In The Shadowed Path, my newest release from Solaris Books and the first new book in the Chronicles/Fallen Kings series in five years, we find out the details of Jonmarc’s back story and the journey that makes him the bitter, scarred, smuggler and former mercenary we meet in The Summoner. Jonmarc knows the hardscrabble life of the Margolan commoner from personal experience. His family was comfortable in their small fishing village, with a father who was a blacksmith and a mother who was a weaver. When his family was murdered, Jonmarc found himself alone and running from dangerous enemies from the age of fifteen. He learned how to survive on his own and navigated the underbelly of the kingdom, the taverns frequented by cutpurses and assassins, the grungy inns that provided havens for mercenaries and brigands. He made his first kill in self-defense the night his family died, and learned his sword skills fighting for his life against sell-swords twice his age. In The Shadowed Path, through Jonmarc’s eyes, we see a very different view of Margolan than the one Tris Drayke knew or recognized. Not only do we see the kingdom differently, but we also see characters differently as we meet them under very different circumstances in a prosperous kingdom under a sane and enlightened king, long before the dark times of the Usurper. I started writing Jonmarc’s back story several years ago as sequential short stories, released individually, that add up to several serialized novels. The first 18 stories are currently out, with several novellas yet to come. Solaris Books wanted to do a collection of the first 10 stories plus commissioned an exclusive eleventh for the book, and of course, I said ‘yes’. Readers who remember the books will recognize the milestones. I intended the stories to trigger strong deja vu for fans of the series. If you’ve read the books and certain junctures don’t make you want to yell a warning, you aren’t remembering the details! For those who haven’t read the books, The Shadowed Path is a perfect starting point. Either way, events in the books will have a whole new meaning once you’ve read the collection and the additional short stories. The Shadowed Path is the first book-length return to my world of The Summoner, in my Chronicles of the Necromancer series, in five years. That makes it a homecoming of sorts, and coming home after a journey is both comforting and a time for a little introspection. Because while home is familiar, neither you nor home ever stay the same. My new book, The Shadowed Path, is a collection of eleven Jonmarc Vahanian Adventure short stories, ten that have been previously released and an exclusive eleventh story only in this volume. They are the first third of Jonmarc’s backstory, sequential stories that were written as a serialized novel, and something of a prequel to The Summoner. I started bringing out Jonmarc Vahanian Adventures short stories a few years ago, wanting to share the story behind the character who is a favorite of many readers. We get glimpses of Jonmarc’s past in the Chronicles and Fallen Kings books, but not the full tale, and I figured it was time to fix that. After I’d written quite a few of the stories, Solaris asked to do a collection of the first ten plus an exclusive extra story, and of course, I said yet. Thomas Wolfe said, “You can’t go home again.” Actually, you can, but don’t expect it to be the same. Both you and the people back home have changed, so home will not be the same place you left. Technically, even if you stayed, change would have still continued, but you would have been part of that change, instead of coming back and trying to merge with a stream that has moved on in its own way, even as you changed too. We all experience this situation when we decide to re-read a book that spoke to us when we read it at a certain age, only to find that it reveals layers of new meanings and nuance to us at a difference point in our lives. Or we discover that a beloved or familiar song or a movie had a deeper, different theme than we realized because we didn’t have the life experience or cultural reference points to understand. I wrote the first draft of what eventually became The Summoner when I was in college. I was 19, the same age as my main character, Tris Drayke. I worked on the book through many, many revisions, and both Tris and the plot changed dramatically. I finished college, went to grad school, got a job, got married, had kids, moved, changed jobs, and continued to work on the book when life permitted. In 2007, when I was 45, the book became an overnight success. Go figure. Over the years that it took to bring The Summoner to life, the character and plot certainly changed and evolved, but there’s still an aspect of innocence to Tris in those first books that remains from who I was when I first wrote the story that I think would be harder for me to recapture it now. I’ve gone from being the same age as my protagonist to having kids the age of my heroes, which is one hell of a perspective shift. I’m still writing about characters who are at an age when all the heroic action comes naturally (and the damage heals faster) and who have the invincibility and energy of people in their twenties and early thirties. But over the years, those characters have grown more world weary and knowing. By The Dread, Tris has shouldered the weight of the world with the burdens of kingship, and while Jonmarc achieves a redemptive arc, Tris heads toward a future where dark omens still loom. Blaine McFadden’s series, the Ascendant Kingdoms Saga, is much darker and grittier, post-apocalyptic medieval, with characters who have already survived both family trauma and hellish conditions. In Iron and Blood, several key characters are military veterans who saw action during the Rancher Wars, and others are reeling from personal loss. And in Deadly Curiosities, Cassidy’s innocence is an early casualty as she learns the secrets behind the family business she has inherited and its real role in eliminating supernatural threats and saving the world. Since I’m not 19 or 23 or 25 anymore, I can view those characters not only through the lens of my own remembered self, but also now by watching my kids and their friends and significant others, asking myself how they would handle a situation, what choices and alternatives might occur to them given their perspective and life experience. And in subtle ways, that changes how I understand the characters, how the characters make decisions, and how they process the repercussions. I know more about choice and ramifications than I did when I was younger, about good intentions and the road to perdition and unintended consequences, about preparation and sheer damn luck–good and bad. And I grasp now in a way I couldn’t back then, bone deep, that sometimes bad things happen to good people, and sometimes grace smiles on the unworthy and valiant, and that the greatest heroism lies in surviving. The world has changed as well. I started the book that became The Summoner in the last years of the Cold War, before the Wall fell. Wars between kingdoms felt familiar, because war between superpowers was always looming in the background. Then 9/11 happened, and the American mind finally grasped what the rest of the world had lived with for a long time, the idea of free-floating, constant insecurity and vulnerability, the fear of a stateless enemy, the existence of amorphous evil with a human face. I see those changes in my writing, from the conflicts in the first four Chronicles books to the non-aligned threat of The Dread, to the warlords and nomadic raiders of the Blaine McFadden books, to the supernatural terrors of Deadly Curiosities and Iron & Blood that hinge on obsession and vengeance. I guess I’ve been trying on variations of the apocalypse to check the fit. My personal world changed too, and that played out through the books. My relationship with my father was painful and complicated. I did not realize until much later that in four series, my main characters’ fathers die tragically. Writing that into the books wasn’t conscious or intentional, but it still managed to surface. I was writing Deadly Curiosities when my father passed away and we cleaned out his house and handled his affairs. Many of the objects from his collection and the storage facility I spent that summer in cataloging and appraising odd collectibles found their way into the books with a few dark twists. Moving forward, I imagine those changing viewpoints will continue to affect my writing, since we have tie-in short stories and novellas that extend all the series as extra ‘episodes’. For me, it’s a natural progression since the characters themselves need to evolve and change as they experience wins and losses and grow into new phases in their lives. I can already see where those factors affect the new epic fantasy series I’m writing for Solaris, and the characters that are developing there. I’m very intrigued by the possibility of having characters, old and new, approach their challenges with evolving perspective, even as my readers change through their own life stages and as I experience the shifting perspectives that come with time, constantly changing, but still finding our way home to the things we love. What makes epic fantasy so … epic? Some of it is scope. Epic fantasy series tend to think big: the rise and fall of kingdoms, the machinations of kings, huge battles, the fate of the world in the balance. Epic fantasy, almost by definition, tends to be in a medieval setting. Monarchs, walled cities, pre-industrial technology, battles with trebuchets, catapults and … swords. Swords and sword fights are definitely part of epic fantasy, along with knives, crossbows, longbows and other medieval armaments. If you think that limits the inventiveness of battle, take a look sometime at Leonardo DaVinci’s schematics for war machines. I’ve used some of those machines in conflicts in my prior books, and they were fun game changers. There’s so much more to epic fantasy though than just the swords. Sure, understanding the battle tactics and weapons that are period-authentic is important for credibility, and necessary in order to be able to write exciting and realistic combat sequences. But battles take place within a larger world, impacted by technology, medicine, magic–or the lack thereof, geography, and so much more. In order to make an epic fantasy book and series compelling, it has to offer a window on a unique world, to take the reader somewhere he or she has not been before. World-building is a huge part of epic fantasy, because even if some elements are familiar from the real world, essential differences in history, magic, resources and politics provide the core of the story and the setting for the conflict. Compelling epic fantasy ushers the reader into a world filled with sights, smells, sounds and textures, complex and multi-dimensional. It’s my job as an author to help you find your way around, understand what makes the world unique, experience it for yourself through the eyes of the viewpoint characters. Those characters are products of their world, and they move through it native-born, forged from its history, politics, losses and conflicts. We understand the world through the eyes of those characters, through the lens of their experiences, through their reactions. The characters would not be who they are if they existed in any other reality. They have been shaped by their environment, and they are uniquely suited to fight and survive because of that. In order to create a believable epic fantasy world, it helps to be well-versed in our own world’s medieval history. Real world history is a good starting point for insight into the politics, intrigue, battle techniques, weaponry, medicine, lore, superstitions, belief systems and even cooking techniques of a world with technology and scientific understanding on a pre-seventeenth century level. It requires thinking about everyday life in a time of slow communication, no antibiotics, poor sanitation, travel limited to the speed of horses or a walking pace. It also requires understanding a very different web of human connection than we experience in our modern world. Most people never strayed beyond the village where they were born, and spent their whole lives around the same couple of hundred people unless they lived in a large city. Depending on their social status, they might owe fealty to a lord, or be bound to the land, might be slave or free, and would be obligated to conform to a set of social and religious conventions we moderns find difficult to comprehend. All of those components are part of what I’ve always loved about epic fantasy, whether it’s as a reader or as a writer. Epic fantasy worlds are as real as our own history, but different thanks to magic and essential shifts in fate and fortune. I studied medieval history in college, and continued that education unofficially ever since, through books and travel. Walking through castles in Wales, wandering ruins in Rome, exploring walled cities in Malta or Croatia made it clear to me that while that history was unquestionably ‘real’, it was also as far removed from my personal experience as the magic-infused worlds of my epic fantasy. It took just as much imagination for me to think of myself navigating the everyday world of those real places as it did for me to think of myself inhabiting my own epic fantasy settings or those of my favorite authors, and that was without factoring in magic. So for me, all of those elements make epic fantasy compelling. The swords are important, but they’re just part of a larger whole, a world apart, somewhere that reminds us of our own past, but with crucial differences. And magic. Swords–and magic. I write four different fiction series–two epic fantasy series (Chronicles of the Necromancer/Fallen Kings Cycle and the Ascendant Kingdoms Saga), an urban fantasy series (Deadly Curiosities), and the Iron & Blood Steampunk series co-authored with Larry N. Martin. Lately, I’ve been bringing out a book a year in at least three of the series. But what about the other 11 months between books? How about tie-in ebook short stories and novellas with additional adventures featuring the characters from the novels for a more detailed, in-depth look at the world and the people? I started writing tie-in short stories with my Jonmarc Vahanian Adventures, which will eventually be the equivalent of three serialized novels that are prequels to The Summoner, the first book in my Chronicles series. Jonmarc is a favorite character from the Chronicles series, someone who plays a major role, but whose back story is not fully explored in the books. Solaris Books, the publisher of the first four Chronicles books, has now published The Shadowed Path, a collection of the first 10 Jonmarc stories plus an exclusive eleventh story, in print and ebook. There are 18 Jonmarc stories (the equivalent of the first two serialized novels), and I plan to have the last three novellas finished this year. My Deadly Curiosities novels are dark urban fantasy, set in modern-day Charleston, SC with an alliance of mortals and immortals that battle supernatural threats, fight monsters, and get cursed objects off the market and out of the wrong hands. There are two novels so far in the series, and 18 short stories in my Deadly Curiosities Adventures tie-ins on ebook. The short stories function like extra ‘episodes’ for a TV series, with lots of action and adventure. Modern Magic: Twelve Tales of Urban Fantasy, the new 12-full book, 13 author ebook boxed set, is currently the only place you can get Trifles and Folly, the collection of 10 Deadly Curiosities short stories. For my Ascendant Kingdoms post-apocalyptic medieval epic fantasy series, the extra novellas fill a six year ‘gap’ at the beginning of Ice Forged, the first book in the series. Something major happens, there is a six year fast-forward, and the main action of the book begins. Readers wanted to know more about the gap, so three novellas–Arctic Prison, Cold Fury and Ice Bound–tell the story of Blaine McFadden’s imprisonment in Velant (collected as King’s Convicts on ebook), with three more novellas to come about Blaine’s years as a colonist on Edgeland. And along the way, readers get to know main and secondary characters better and find out how the key relationships formed that affect the rest of the series. Iron & Blood, the Steampunk series I co-write with my husband, Larry N. Martin, also have a tie-in series, The Storm and Fury Adventures, which feature Mitch Storm and Jacob Drangosavich, agents with the Department of Supernatural Investigation. Mitch and Jacob are secondary characters in the books, but are the protagonists (so far) in the short stories and novellas, which also add more ‘episodes’ and further explore the alternate history 1898 Pittsburgh and environs of the novels. Expanding a series with short stories and novellas works for authors and readers. Readers don’t have to wait a year or more before the next book comes out to get more of favorite characters and adventures. Authors create a chance to attract new readers and keep current fans happy with extra, shorter adventures, and create indie-published content that can be used in collections, anthologies and used in promotion. Publishers benefit from increased sales of the original series as new readers find their way to the novels. It’s a win for everyone.